Event Admission, Timed Race Entry, Finisher Medal, Finisher T-shirt, Rockin After Party, Free Photography, and Mud in your pants! Special wristband is your pass to multiple laps, earn the BONEFROG Endurance medal and earn additional frog pins for each lap through the Sprint course. Each Sprint lap earns you 1x Green frog pin, completing your fifth Spring lap earns you the coveted Gold frog pin, if you complete a 10th lap you are awarded a second Gold frog pin. Will you be the FIRST double Gold frog recipient? Spectator Pass ($10) is required for Spectators age 13 and over. We love our volunteers! In return for volunteering you'll get free entry to one of our races. You can sign up to volunteer on the Bonefrog event page. The BONEFROG event offers fun activities for all ages. Let the kids come watch you race and then let them loose in our Mini BONEFROG Kids Area where they can play in the mud and race on scaled down obstacles all day. We have always subscribed to the “work hard, play hard” mentality and our after party is not to be missed! Music, BEER, Food and Fun... Celebrate finishing one of the hardest OCR’s in existence with the BONEFROG family! For participants and spectators alike. It's called the SEAL "TEAMS" for a reason. While you are allowed to run the Bone Frog Challenge as an individual we highly encourage making or joining a team! The $15 insurance fee covers you for medical expenses should you be injured during the event. Everyone is required to pay for this coverage, regardless of your own health insurance status. 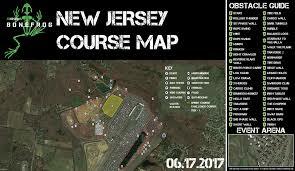 How was Bonefrog New Jersey?